Rogers Plus is the latest in a series of stores (along with BestBuy, Future Shop, and BlockBuster) that has begun accepting used trade in games. 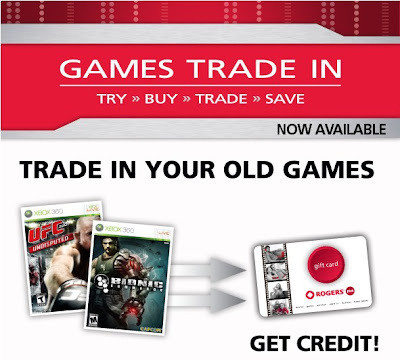 Rogers is also offering premium value trade ins for games like UFC (37$ @EB Games), Halo Wars (40$ @EB Games) and Resident Evil 5 (40$ @EB Games) – topping in at 40$ each which based on a quick comparison is in line with other vendors. But to add to the trade in you also get the bonus of Star Rewards for each trade in meaning discounts and free rentals are in your future. Store credit also seems to apply to the purchase of DVD’s and other Roger’s services (I’ll confirm this the next time I’m in a retail location).